Witches in Victorian London. Need I say more? Ok ok, I also really dig how the mere fact that the cousins claim their power actually opens the freaking gates of hell!! Eeep O.O I can't wait to sink my teeth into this story - AND discover that secret magical underworld. 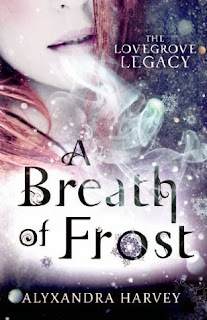 What do you think about A Breath of Frost? Oh heck yeah, added that to Goodreads! I so want to read this now so thank you for sharing! This sounds completely awesome! I don't read enough books with witches in, but I'll definitely be picking this one up. I've seen the book before but never read it myself. Looks like a good read though! I hope it is and you get it soon and enjoy it! I need to thank you for showing this to me. How have I not seen it before? It sound perfect for me! I hope it executed everything well! I hope you're having a fantastic Friday! Oh, a YA in Victorian England. This sounds really good. I really would like to read this.